If an individual, family or business has long lived for the day and disregarded the morrow, spending more than it earns, buying what it doesn’t need and can’t afford, making foolish and reckless “investments” (which are actually consumption) and borrowing more than it can repay, then it must eventually face a reckoning. When that day arrives, what must it do? Few people would prescribe more of the same: that’d be like taking an alcoholic on a pub crawl. Most would agree that a profligate family or business must ultimately mend its ways. Whether it likes it or not, it must live within its means. President George W. Bush seemed to agree. During a news conference on 20 December 2006, by which time it had become clear that air was rapidly leaking from the housing bubble, he urged Americans to “go shopping more.” Why? Because, he seemed to say, spending drives the economy and the more of it the better. Most economists concur: the more people spend, the wealthier their society becomes. Conversely, if aggregate expenditure decreases then a downward spiral ensues; and because (they say) a market economy doesn’t and cannot self-correct, the tailspin will continue until the government intervenes and spends on everybody’s behalf. Once this happens, they assure us, the free-fall ceases, economic conditions stabilise and everybody can once again borrow, spend and grow rich. Hence the annoyed response of President Bush, in an interview with The Washington Times on 12 January 2009, to the miniscule band who criticised his endless borrowing, spending, intervening and warmongering. Like Colonel William Calley at My Lai, who destroyed a village in order to “save” it and massacred ca. 350-500 women, children and elderly people in order to “protect” them from the Viet Cong, President Bush said “I’ve abandoned free market principles to save the free market system … You can sit there and say to yourself ‘well, I’m going to stick to principle and hope for the best, or I’m going to take the actions necessary to prevent the worst.’” At times of crisis, he seemed to say, free market principle must yield to interventionist pragmatism. Why did Bush believe that this course of action was necessary? Why would it prevent the worst? How could he be sure that his policies would not actually make a bad situation even worse? Bush told his interviewer that he relied upon the advice of Henry Paulson (the Secretary of the Treasury) and Ben Bernanke (the Chairman of the Board of Governors of the Federal Reserve System). Paulson’s and Bernanke’s advice, in turn, faithfully reflected the prejudices of John Maynard Keynes (1st Baron Keynes of Tilton, CB, 1883-1946). If you [are] going to turn to only one economist to understand the problems facing the economy, there is little doubt that the economist would be John Maynard Keynes. Although Keynes died more than a half-century ago, his diagnosis of recessions and depressions remains the foundation of modern macroeconomics. is badly written [and poorly organised]; any layman who, beguiled by the author’s previous reputation, bought the book was cheated of his five shillings. It is not well suited for classroom use. It is arrogant, bad-tempered, polemical, and not overly-generous in its acknowledgements. In it the Keynesian system stands out indistinctly, as if the author were hardly aware of its existence or cognisant of its properties; and certainly he is at his worst when expounding on its relations to its predecessors. Flashes of insight and intuition intersperse tedious algebra. An awkward definition gives way to an unforgettable cadenza. When it is finally mastered, we find its analysis to be obvious and at the same time new. In short, it is the work of genius. A few of Keynes’ contemporaries viewed him and TGT in a very different light. To them, Keynes was the consummate politician-economist who craved and acquired fame and fortune by elevating politicians and officials to the pinnacle of economic and financial significance. Keynes exalted the political class as the guardian of employment, growth and prosperity. He also imputed to it great civic virtue, and blessed it to do what it does best: favour particular producers, oppress most consumers and all taxpayers, debase the currency and foment war at home and abroad. In Australia, the Prime Minister (Kevin Rudd) and Treasuer (Wayne Swan) presented to the Treasury Secretary (Ken Henry) a copy of TGT – inscribed with their thanks for his faithfully Keynesian response to the GFC. In most countries during the past several years, politicians and their advisors, whether of the “left” or the “right,” have fervently espoused the doctrine that governments must spend their way into massive deficits (because they “stimulate the economy”) and thereby spend their way out of recessions. They insist that consumption – whether by individuals, businesses or the state – causes employment and growth. Because consumption allegedly begets prosperity, more borrowing and spending and bigger government is (if they claim they’re “conservative” they sometimes add the caveat “for the time being”) best. Yet when we actually read (rather than merely extol) TGT, we find much that’s puzzling (to put it politely) and even more that’s absurd (to put it bluntly). A terrific book by Hunter Lewis (Where Keynes Went Wrong – And Why World Governments Keep Creating Inflation, Bubbles and Busts, Axios, 2009) helps the general reader to navigate his way through Keynes’s madness. For example, Keynes said – without any reasoning, citation or evidence of any kind – that as a rule people save too much. How to resolve this alleged problem? Through its central bank, the state should print vast quantities of new money. This newly-minted money doesn’t just constitute savings: it is “just as genuine as any other savings” (TGT, p. 82-83). But conjuring money out of thin air doesn’t sound like saving. Even if we grant that it is, why aren’t countries like Zimbabwe and Serbia – which during the past two decades have printed more new money than any other – awash in savings? More generally, why will a tsunami of new “savings” alleviate the alleged problem – namely that people already save too much? But if we can become wealthy simply by collecting boulders, moving them from A to B and then from B back to A, then why do Bangladesh and Haiti remain wretchedly poor? What’s most startling, when one actually reads TGT, is that Keynes offers absolutely no support – whether logical or empirical – for his manifold claims. He advances many bald assertions and intuitive hunches; numerous aristocratic witticisms and much withering sarcasm drip from his tongue; but simply absent are closely-reasoned chains of logic and reams of corroborating evidence. When the world’s governments reacted to the Global Financial Crisis by launching immense economic experiments along Keynesian lines, most people assumed that these trials were actually tried-and-true policies and that somebody had long ago demonstrated that they made theoretical and factual sense. Yet the stark reality remains: a garb of arcane mathematics obscures the fact that Keynesianism is a ramshackle grab-bag of interventionist intuitions and prejudices. Without the intervention of government, Keynes asserted, rates of interest will almost always be too high. “The rate of interest is not self-adjusting at a level best suited to the social advantage but constantly tends to rise too high,” he said on p. 351 of TGT. More generally, “rates … have been [too high for] the greater part of recorded history.”(2) This is why humanity remains mired in poverty. “That the world after several millennia of steady individual saving [sic] is so poor … is to be explained … by high rates of interest” (TGT, p. 242). “High … rates of interest are the outstanding evil, the prime impediment to the growth of wealth [they discourage borrowing and thus investment]” (TGT, p. 351). people “hoard” their money out of fear. This creates a shortage of lendable funds and thus places upward pressure upon rates (TGT, p. 174, 351). it is expensive to “bring … borrowers and lenders together.” This cost also boosts rates (TGT, p. 208, 309). there may be a “wide gap between the ideas of borrowers and those of lenders;”(3) as a result, “wealth-owners” simply do not accept lower rates (TGT, p. 309). What, then, to do? It’s clear to Keynes that the state can and should reduce rates of interest to a more reasonable level. Specifically, if “wealth-owners” withhold their funds from the loan market, or refuse to accept reasonable rates, then the government should reduce rates by increasing the quantity of lendable funds (TGT, pp. 167-168, 197-199, 268 and 298). How to do this? By printing new money which the central bank makes available to commercial banks, and which the commercial banks then lend to individuals and businesses (ATM, chap. 2). The greater the quantity of money, the more money will be available to borrowers and the lower the cost of borrowing. “A change in the quantity of money … is … within the power of most governments … The quantity of money … in conjunction with [lenders’ willingness to lend] determines the actual rate of interest” (TGT, pp. 167-168, 267-268). The greater the quantity of money the government creates, Keynes seems to imply, the lower the resulting rate of interest, the greater the incidence of lending and borrowing and the higher the resultant level of economic activity. According to Keynes, general fears of government intervention and specific fears about a government-engineered increase in the amount of money circulating in the economy are ill-founded. He emphasises that the new money that the government has printed and injected into the banking system is “just as genuine as any other savings” (TGT, pp. 82-83). Further, since “there is no special virtue in the pre-existing [high] rate of interest … [there can be no] evil [in bringing it down by government intervention]” (TGT, p. 328). Indeed, if the government reduces rates of interest, then its ultimate target level for these rates should be zero. “I should guess that a properly run community … ought to be able to bring down the … [general rate of business profits and rate of interest] approximately to zero within a single generation” (TGT, p. 220). "Provided that the government supplies an inexhaustible well of capital – Keynes seems to assume that it can, but provides not the slightest reason why anybody else should believe it – borrowers should not have to pay interest and businesses should not have to pay dividends! Do you think I jest, or that I misrepresent Keynes?" You read that correctly. Provided that the government supplies an inexhaustible well of capital – Keynes seems to assume that it can, but provides not the slightest reason why anybody else should believe it – borrowers should not have to pay interest and businesses should not have to pay dividends! Do you think I jest, or that I misrepresent Keynes? [Our] aim (there being nothing in this which is unattainable) … [should be] an increase in the volume of capital until it ceases to be scarce, so that the [owner of savings] will no longer receive a bonus. The … owner of capital [is] functionless … He can obtain interest because capital is scarce. But … there can be no intrinsic reason for the scarcity of capital [since government can always print and distribute more of it] … [Making capital freely available] may be the most sensible way of gradually getting rid of many of the objectionable features of capitalism. The rentier [that is, landlord or investor] would disappear … and [so would] the cumulative oppressive power of the capitalist to exploit the scarcity-value of capital (TGT, p. 376, 221 and 376). The remedy for the boom is not a higher rate of interest, but a lower rate of interest! For that may enable the boom to last. The right remedy for the trade cycle is not to be found in abolishing booms and thus keeping us permanently in a semi-slump; but in abolishing slumps and thus keeping us permanently in a quasi-boom (TGT, p. 322). The fear of the boom, said Keynes, led the U.S. Federal Reserve to raise the already-too-high rates of interest in the late 1920s. This led directly to the Great Depression. “I attribute the [economic] slump of 1930 primarily to the … effects … of dear money which preceded the stock market collapse [of 1929], and only secondarily to the [financial] collapse itself” (ATM, p. 176). If at first you don’t succeed, Keynes urges, keep trying. In particular, if the government prints a great deal of new money and injects it into the banking system, then rates of interest should fall. But if they don’t fall far enough or quickly enough to the “optimum level” – namely zero – then the state must undertake “other measures” in order to boost investment (TGT, p. 164, 243). “Wealth-owners” whom the state has not yet completely displaced as lenders and who will likely find low rates “unacceptable” might be able to block them. If so, then “the State, which is in a position to calculate … on long views and on the basis of general social advantage … [will have to] directly organise investment” (TGT, p. 164). For now, national governments must take all necessary steps to suppress rates of interest and to maintain them at a suitably low level. Eventually, however, global institutions should undertake and co-ordinate this task. In particular, Keynes hoped that what has become known as the International Monetary Fund (he helped to establish it) would act as a global central bank. If given the power to print unlimited amounts of money and inject it into the global economic system, it could reduce interest rates around the world, maintain them at a very low level and create a worldwide quasi-boom (see, for example, Skidelsky, John Maynard Keynes, vol. 3, p. 227, 247, 255 and 302-303). Throughout TGT, Keynes defines his terms ambiguously, contradictorily or not at all. When he asserts (p. 351) that “the rate of interest is not self-adjusting at a level best suited to the social advantage but constantly tends to rise too high,” he doesn’t tell us what the “social advantage” is, or what rate is most socially advantageous. About one thing he is, however, crystal clear: he doesn’t trust the price system. Perhaps because he doesn’t know it,(6) Keynes doesn’t tell us that rates of interest are prices, and that prices are vital signals to buyers and sellers, producer and consumers, and borrowers and lenders. All prices are ultimately interconnected; but rates of interest directly affect most prices. If rates become corrupted, then they emit misleading and false signals; even worse, bastardised rates rapidly spread misinformation throughout the economy. Intervention by governments in credit markets, like other attempts to countermand prices set in free markets with prices set by politicians and bureaucrats, has not – to put it mildly – achieved great success. If the Soviet Union collapsed because it did not allow prices to tell the economic truth, then Keynes’s maniacal desire to suppress rates of interest does not allow rates to tell the truth about borrowing and lending. Keynes says “that the world after several millennia of steady individual saving [sic] is so poor … is to be explained … by high rates of interest” (TGT, p. 242). Really? Are high rates truly the heart of the matter? Even Keynes admits that the safety of principal has always been an issue. In other words, historically rates have been high partly because it has not been safe to lend (TGT, p. 351). In most societies throughout history, property rights have been insecure; as a result, it has not been safe to own property, much less to lend it. The best way to safeguard property has often been to hide it. Why invest if somebody else may well steal its fruits? Throughout history, the most significant “somebody” threatening and stealing property has not been the common thief: it has been the Leviathan state. Keynes’s policy of creating new money in order to suppress rates of interest, and thereby to stimulate investment and economic activity, ultimately backfires. First, “the creation of new money by the central bank” and “inflation” are synonyms. Yes, inflation may well initially place downward pressure upon rates. The trouble is that as soon as somebody borrows the new money, he will spend it. And that spending – people who hold “old” money haven’t changed their behaviour – places upward pressure upon the prices of goods and services. What will happen to rates once prices begin to rise? Lenders will notice that the money returned to them at a loan’s conclusion will not buy as much as it did at the loan’s commencement. How do lenders protect themselves against the gradual destruction of their purchasing power? Either they will lend less or they will charge more per dollar lent. Either way, their reaction to inflation will place upward pressure upon rates of interest. Hence an unintended consequence of Keynesianism: policies which intend to reduce rates of interest eventually raise them. The Swedish economist Knut Wicksell (1851-1926) initially developed this point, and Ludwig von Mises (1881-1973), Friedrich von Hayek (1891-1991) and Murray Rothbard (1926-1995) extended and elaborated it. Nobody – neither Keynes nor any of his followers – has ever refuted it. Do the years since the 1990s, when inflation has raged but the Consumer Price Index and various Producer Price Indices have been quiescent, vindicate Keynes? In these years Keynesianism begat inflation, and inflation fomented bubbles and crashes. After the recession of the early 1980s, governments once again began to print money. Consumer prices rose, but the rise was mild relative to the 1970s. As a result (virtually everybody mistakenly thinks that “inflation” and “annualised percentage rise of the CPI” are synonyms), in the 1990s and beyond rates of interest did not rise as the pace of the government’s inflation accelerated; on the contrary, rates tended to fall. Given the rising inflation and absent the drag of rising rates or (except in the early 1990s and late 2000s) recession, economic conditions seemed to boom. Contrary to the 1970s, in recent years central banks have injected vast amounts of new money into the economy without triggering sharp rises of consumer prices or rates of interest. Many people have concluded that these developments vindicate Keynes. For two reasons, they don’t. First, a rise of consumer prices is one of several possible consequences of inflation. But high inflation need not cause a hefty rise of consumer and producer prices. (7) During some intervals (the 1920s was one, and the past two decades has been another) technological, logistical or other developments boost businesses’ productivity and reduce their costs. In the 1920s, electrification was the key development; in the 1990s, the advent of the Internet and the integration of the Chinese and ex-Soviet economies into the world economy (which placed sharp downward pressure upon the prices of raw materials and labour) were the triggers. All else equal, technological, logistical and other productivity-enhancing innovations place downward pressure upon prices. If prices should fall by (say) 3% per year (as they did in the latter half of the 19th century, another period of strong technological and logistical innovation) but actually rise by 3%, what’s happening? The answer is that the central bank is creating and injecting into the economy enough new money to raise prices (that is, reduce the currency’s purchasing power) by 6%. In short, technological and other developments can mask one of the possible consequences of the government’s policy of inflation. Secondly, the new money ginned by the central bank doesn’t flow solely into markets for consumer goods and services. Since the mid-1990s, and unlike the 1970s, the effects of governments’ inflation haven’t, by and large, appeared in workers’ pay packets and in supermarkets. Instead, during the past 20 years the new money has flowed disproportionately into stocks, bonds and real estate. To use the common (and imprecise) parlance, if the 1970s was a period of high “consumer price inflation” then “asset price inflation” has plagued more recent years. The problem is that inflation (whose consequences technological developments have masked) and rising prices of assets conspire to create asset price bubbles. What looks like a moderate CPI reassures lenders and thereby helps to restrain the rates of interest they charge. This, in turn, makes it easy for people to borrow ever greater sums in order to buy stocks, bonds and real estate. The demand for these assets created by the borrowed money puts upward pressure upon these assets’ prices; as their prices rise, lenders are increasingly willing to lend; and borrowers, observing the steadily rise of prices, are increasingly willing to borrow. Eventually, the new money channelled into these assets creates bubbles. This means that, contra Keynes, artificially-low rates of interest will in the long run lead not to a quasi-permanent boom but to a cycle of boom and bust (although the path of bust may lead either through “consumer price inflation” or “asset price inflation”). 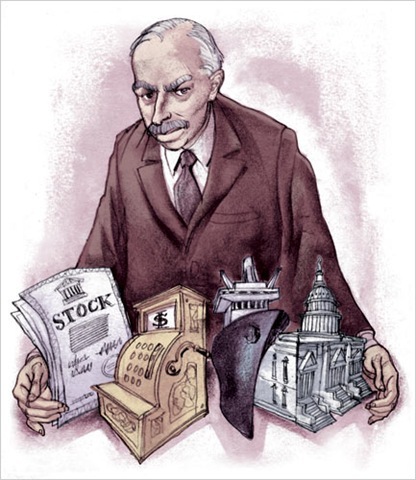 Mises exposed many of Keynes’s other misconceptions about interest. Perhaps most notably, it’s downright Orwellian to refer to newly-printed government money as savings. Money created ex nihilo by the government isn’t savings; indeed, this funny-money destroys savings. Whatever the merits or demerits of the monetary printing press, or its electronic equivalent, it isn’t and it doesn’t produce savings. The word “savings” describes income that has been earned but not consumed; rather, it’s set aside for investment or a rainy day. It takes much self-control to save, but the government requires absolutely no self-discipline to inflate. Quite the opposite: inflation is the indicator par excellence of governments’ profligacy. Nor should anybody imagine that, as Keynes insisted, the government’s newly-created money will augment or “top off” traditional savings. Instead, the inflation will ultimately erode the purchasing power of real savings and thus injure the saver (especially the saver of modest means). Can we abolish scarcity with new money? There cannot be any question of abolishing interest by any institutions, laws or devices of bank manipulation [such as the government injecting new money into the economy through commercial banks]. He who wants to “abolish” interest will have to induce people to value an apple available in a hundred years [at a price that is] no less than a present apple (Human Action, p. 529). 1. Billions of people live in poverty because food, clothing, shelter and amenities are scarce (and hence expensive for the poor). In order to help the poor escape poverty, all of us must live within our means, save and invest. Only by these means can more and better goods and services be produced more cheaply, so that the poor can better afford them and thereby raise their standard of living. 2. The problem isn’t that goods and services are scarce: it’s that money is scarce. Government should therefore create so much new money that everybody has enough of it. Clearly, view #2 is fallacious. It hasn’t worked in the past (if it had, there would be no poverty today) and there’s no reason to believe that it will in the future. Even if the central bank gave $1 million of new money per year to every poor person, it would avail the poor nothing: there would be much more money in the world, but no more food, shelter, clothing, etc. The torrent of new money would simply place tremendous upward pressure upon prices. People who were poor on $10,000 per year would therefore be poor on $1 million per year – and, it’s vital to add, people who hitherto weren’t poor on $150,000 per year would now be destitute. Inflation, in other words, doesn’t alleviate poverty: it creates it. Ask the middle-class Germans of the 1920s, Argentines of the 1970s or Zimbabweans of today. 3. The problem isn’t that goods are scarce: it’s that lendable funds are scarce. If the government provided unlimited funds to borrowers, they could use those funds to build new factories and businesses, and within a generation nothing would be scarce. This is Keynes’s view,(9) and it’s just as fallacious as #2 (to which it is closely related). Printing money and lending it to people will have exactly the same result as printing money and giving it to people. Either it will make existing goods and services cost more, or it will make assets cost more. Both will cause rather than resolve problems. 1. See in particular Roger Garrison, “Is Milton Friedman a Keynesian?” in Mark Skousen, ed., Dissent on Keynes: A Critical Appraisal of Keynesian Economics (Praeger Publishers, 1992). 2. John Maynard Keynes, Collected Writings, vol. 20, Activities 1929-31: Rethinking Employment and Unemployment Policies (London, Macmillan, 1981), p. 273. 3. John Maynard Keynes, Collected Writings, vol. 6, A Treatise on Money (London, Macmillan, 1971), p. 339. (Hereafter referred to as “ATM”). 4. Robert Skidelsky, John Maynard Keynes, vol. 3, Fighting for Britain: 1937-1946 (London, Macmillan 2000), p. 281. 7. An increase in the prices of consumer goods and services as measured by the CPI is not a definition or synonym of inflation: it is one of several possible consequences of inflation. Others include bubbles in stock, bond and real estate markets, rising interest rates and (in extreme cases) collapses of the currency. Inflation, as British classical school and Austrian School economists define it, is (stripped to its essentials) an increase in the supply of money not backed by a corresponding demand for money (i. e., savings). In an age of fiat money (that is, money whose definition is decreed by government rather than agreed in a free market, and whose regulation the state monopolises), only one entity can create inflation. No person or business or other private organisation (such as a trade union) can inflate the supply of money: only the central bank (using commercial banks as its agent) can. Ludwig von Mises introduced this insight in The Theory of Money and Credit (1912), and extended and elaborated it in Human Action (1949). 8. Ludwig von Mises, Human Action: A Treatise on Economics (Fox & Wilkes, 1966), p. 562.